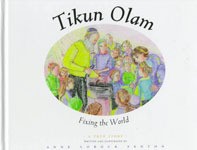 Tikun Olam, which is Hebrew for “fixing the world,” is a heartwarming children’s story of Mr. Mitzvah Fixit, a good-natured handyman who tries to fix his sick friend, Dr. Mender. Presented within the context of Judaic tradition, this book can help children and parents alike come to terms with the death of a family member. Mr. Fixit tries many things to fix his sick friend: he uses his tools to make entertaining gadgets, sings songs and prayers, and even breaks his heart in two and gives Dr. Mender the larger piece. Despite his best efforts, he cannot prevent Dr. Mender from dying. After his death, as Mr. Fixit grieves for his lost friend, he realizes that maybe Dr. Mender “didn’t need to be fixed . . . maybe you were just supposed to do your job somewhere else and I’m supposed to keep doing my job in this world for now.” This skillfully rendered, full-color illustrated book, with powerful symbols from Jewish mysticism presents children with a sensitive, inspiring tale. Author and illustrator Dr. Anne Lobock Fenton is a child psychiatrist living in Lexington, Massachusetts and the mother of seven children. Her husband, Dr. Martin Fenton, also a psychiatrist, died of a brain tumor in June, 1996. In this book she tells an inspiring tale to help parents and their children cope positively with the death of a parent.